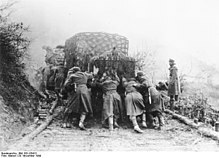 In war, corduroy roads are often used as an emergency measure where poor quality roads have been damaged by the large numbers of vehicles or troops that have passed over them. Seen here are Germans in Yugoslavia in 1944. A corduroy road or log road is a type of road or timber trackway made by placing logs, perpendicular to the direction of the road over a low or swampy area. The result is an improvement over impassable mud or dirt roads, yet rough in the best of conditions and a hazard to horses due to shifting loose logs. Corduroy roads can also be built as a foundation for other surfacing. If the logs are buried in wet, acidic, anaerobic soils such as peat or muskeg, they decay very slowly. A few corduroy road foundations that date back to the early 20th century still exist in North America. One example is the Alaska Highway between Burwash Landing and Koidern, Yukon, Canada, which was rebuilt in 1943, less than a year after the original route was graded on thin soil and vegetation over permafrost, by using corduroy, then building gravel road on top. During the 1980s, the gravel was covered with a chip-seal. The late 1990s saw replacement of this road with modern road construction, including rerouting of the entire highway. In World War II they were used by both German and Soviet forces on the Eastern Front. In a slang application, corduroy road can also apply to a road in ill repair, having many potholes, ruts, or surface swellings. This should not be confused with a washboard road. In the Pacific Northwest roads built of spaced logs similar to widely spaced "army track" were the mainstay of local logging practices and were called skid roads. Two of these, respectively on the outskirts of the milltowns of Seattle and Vancouver, which had become concentrations of bars and logger's slums, were the origin of the more widespread meaning of "skid road" and its derivative skid row, referring to a poor area. The puncheon or plank road uses hewn boards instead of logs, resulting in a smoother and safer surface. The Wittmoor bog trackway is the name given to each of two historic plank roads or boardwalks, trackway No. I being discovered in 1898 and trackway No. II in 1904 in the Wittmoor bog in northern Hamburg, Germany. The trackways date to the 4th and 7th century AD, both linked the eastern and western shores of the formerly inaccessible, swampy bog. A part of the older trackway No. II dating to the period of the Roman Empire is on display at the permanent exhibition of the Archaeological Museum Hamburg in Harburg, Hamburg. This type of plank road is known to have been used as early as 4,000 BC with, for example, the Post Track found in the Somerset levels near Glastonbury, England. This type of road was also was constructed in Roman times. The name "corduroy road" refers to the road's ridged appearance similar to corduroy fabric. ^ Lay, Maxwell G (1992). Ways of the World: A History of the World's Roads and of the Vehicles that Used Them. Rutgers University Press. p. 43. ISBN 978-0-8135-2691-1. Wikimedia Commons has media related to Corduroy roads. This page was last edited on 11 March 2019, at 22:42 (UTC).